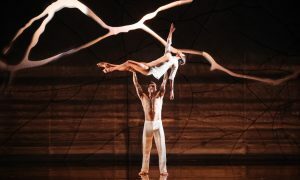 The Australian Ballet's Kevin Jackson, Ty King-Wall and Robyn Hendricks in 'Spartacus'. Photo Justin Ridler. Spartacus tells the story of a gladiator who leads a slave rebellion against the Roman Empire, not in the quest for power but in the name of love. This story was popularised by Howard Fast’s novel of the same name in 1951, with the iconic Hollywood sword and sandal production directed by Stanley Kubrick that starred Kirk Douglas and Laurence Olivier in 1960. The first version of Spartacus the ballet to be seen on the Australian stage premiered in 1978, with The Australian Ballet using the choreography of Russian László Seregi. The production toured New York; Washington, D.C.; and Costa Mesa. The premiere dancers at that time were Gary Norman and Marilyn Rowe. The Australian Ballet’s Spartacus. Photo by Justin Ridler. When did this idea of a new Spartacus start keeping Jervies awake at night? That doesn’t mean Jervies has been obsessed with the idea since then, but every so often he would be reminded of his dream to create a new Spartacus, until the right moment came about three years ago. “At the time, I had been assisting David (McAllister) with his new Sleeping Beauty, and I kind of hijacked one of our meetings by asking if could we talk about me and my career!” Jervies admits. McAllister asked Jervies what he really wanted to do, and when Jervies said he wanted to create a new Spartacus, the Artistic Director was initially lost for words. No wonder, when we consider the enormity of such a project. With a cast of 75 dancers, having to condense the original four-hour long score by Russian composer Aram Khachaturian to two-and-a-half hours, and creating a new aesthetic with sets and costumes as well as creating new choreography from scratch, Spartacus is a huge undertaking. Actually, McAllister confided later to Jervies that producing a new Spartacus had been one of his own long held dreams, and now in 2018, the dream has become reality. There have only been six versions of Spartacus, including the original Leonid Yakobson version for the Kirov Theatre in 1956, and the famous version by Yuri Grigoriev in 1968, for the Bolshoi Ballet. The pressing question for Jervies is why do we need a new Spartacus? The elements that drive the new interpretation are political realities that have emerged through history, including our present time with emergent authoritarian and Populist regimes. However, Jervies, the contemporary artist, also wants to put on stage a world that dwarfs the population. “Consider archetypal dictators who erect huge statues of themselves,” he adds. “So we came up with one bold gesture: a series of walls. Trump is talking in our own time of erecting a wall between the US and Mexico.” These behaviours are current, and so is the political message inherent in this ballet. In Spartacus, look out for a nod to the Bolshoi for one of the lifts, and another nod to Graeme Murphy, with no clues given. Another crucial aesthetic has been to make the fight scenes as dynamic and realistic as possible, hence the need to engage Fight Director Nigel Poulton, who has worked on The Sopranos, Boardwalk Empire and The Bourne Legacy. And as you can imagine, balancing the twin elements of beauty and terror present their own challenges. In an age of big budget action films and real combat sport gladiators, Jervies wanted to counterbalance a narrow vision of Spartacus as an Alpha Warrior. He is not depicting Spartacus as a kind of historical action drama but instead a political love story/tragedy. In terms of Spartacus, the character, Jervies explains that he had no intention of celebrating toxic masculinity. “Because Spartacus isn’t a brute. Everything he does, he does for love. He is a leader, carer, lover, and he just happens to be a great warrior due to his natural strength. At his core, he’s tender; we might call him a sensitive new age guy,” Jervies adds with a chuckle. The Australian Ballet’s Spartacus plays at the Sydney Opera House November 9-24. For tickets, head to australianballet.com.au/the-ballets/spartacus. By Elizabeth Ashley of Dance Informa.